I was not interested in The Amazing Spider-Man film. Rebooting a franchise that's barely 10 years old seemed like a last ditch effort for Sony to hold onto the rights to the franchise, and the trailers didn't impress me. I didn't see the movie in theaters, but I did end up catching most of it on a plane trip. I was not pleasantly surprised, and it was pretty much as bland as I expected it would be. I'm trying to understand is...why did I buy this figure of a character design I'm not a big fan of, from a film that I was utterly unimpressed with? I don't know. Maybe the allure of a Walmart exclusive just causes me to bite. 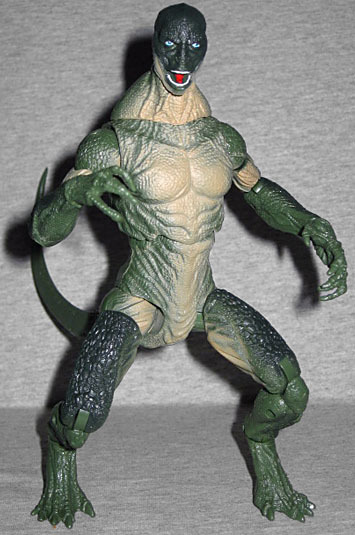 Maybe it's the fact that even if it's uninspired, this is still a highly articulated figure of a lizard monster, and that's hard to pass up. Whatever the reason, I now own a figure of Rhys Ifans as the Lizard from The Amazing Spider-Man, so I guess I might as well discuss him for someone's benefit. A radical experiment turned Dr. Curtis Connors into the mutated menace The Lizard, a fearsome enemy of Spider-Man! Inevitably, this will be compared to its Marvel Select counterpart. 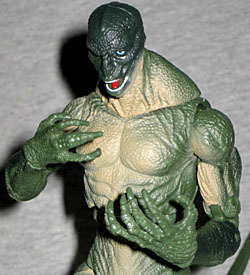 I'm no fan of Marvel Select, but I was impressed with the sculpt and paintwork of their version of movie Lizard. Hasbro's version is actually quite different in many respects. For example, MS Lizard is much bulkier. Hasbro's is skinnier, particularly in the face area, and thus actually does a nicer job of capturing the likeness of the lanky Rhys Ifans. The sculpt is scaly and textured, with lots of flappy folds that give it a leathery look. His mouth is opened in a snarl, revealing rows of almost human-like teeth. The detail all over is really quite sharp and done very well. Whether you like the design or not, this figure represents it excellently. One interesting note: the right arm, which is the one Dr. Curt Connors is missing in human form and regrew with the Lizard serum, only has for fingers on its hand (making it more reptialian). The left hand has five. The paint doesn't live up to the sculpt's high standards. The MS version really wipes the floor with Hasbro's in this category. The face is rather inconsistent, with some nice paint work on the human-ish blue eyes, but less stellar work on the mouth. The teeth and tongue get painted, but the rest of the inside of the mouth is solid molded green plastic. Most of the figure is molded in a medium green, with a spray of darker green on the dorsal (back) side, and a brownish yellow on the ventral (chest and stomach) side. Unfortunately, when the figure is in its default, "at rest" pose, the paint doesn't quite match up everywhere the way it's supposed to. The right arm, in particular, utilizes far too much of the brown and not enough of the dark green, and it's very obvious. The tail is completely devoid of paint, and is molded in solid green. Additionally, the hands below the wrist and the feet below the ankles are entirely unpainted, including the claws. After comparing mine with other examples, it seems that these issues are not unique to my Lizard. Hasbro's Lizard gets plenty of articulation. He has a balljoint at the base of the head, a peg and hinge joint where the neck meets the shoulders, peg and hinge shoulders, peg biceps, double-hinged elbows, peg wrists, balljointed chest, peg and hinge hips, peg thighs, double-hinged knees, peg and hinge ankles, and a peg and hinge joint at the base of the tail. The way the figure is packaged makes the second neck joint look awkward, like he has two sets of neck muscles, but it's easily adjusted once the figure is out of the package. While his articulation count is quite impressive, it's pretty lame that we only get peg wrist joints. And his jaw design is just begging for a hinge! One area in which this figure surprises is its accessories. He's a large figure, coming in at 8" tall with his legs fully extended, so you'd think Hasbro would have tried to get away with packaging him with nothing, or at most the included display base (featuring the hexagon-style bases that are now apparently standard with all Marvel figures, first seen with Walmart's Avengers line). 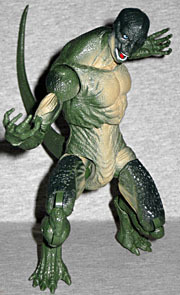 But Hasbro's Lizard also gets some reptile sidekicks (or should I say, "ssssidekickssssss"). Seriously, it calls them reptile sidekicks right on the package. He comes with three unique lizard friends, each with their own sculpt and paint apps. Understandably, they're all unarticulated PVC pieces. They're all based on real animals, too. The largest is a green iguana, with yellow painted eyes and a dark, almost turquoise upper body that fades to a lighter green below. The smallest is a thick-tailed gecko, yellow with black spots and green eyes. Finally, probably the coolest scaly amigo is the bearded dragon, all puffed up in a threat display. He's brown, with a darker brown wash, and spooky red eyes. 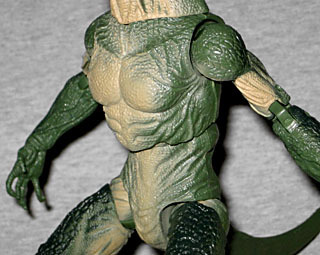 Hasbro's Lizard isn't a horrible figure. It's not even a bad figure. It's got a great sculpt and great articulation, and the reptile sidekicks are pretty awesome. But the paint definitely leaves me cold (blooded...HA!) and the design itself leaves something to be desired (though I suppose you can't fault Hasbro for that). Even with the lackluster design, I'd still call this figure awesome if it wasn't for the lazy paint apps. Parts that don't match up would be annoying enough, but the unpainted extremities really pull this figure down. If you really need to get a Goomba, er, Lizard, I'd have to give the edge to the MS version. Unless you're in it for the reptile sidekicks, which would look really cool in a jungle or desert diorama.